Last week I only had the desire to eat bagels and pizza. Does anyone else get into a “food mood”? These food anti-cravings I have are annoying. They cause me to be grossed out by basically everything that is even remotely good for me. Worse, this type of food is not good material for food blogging either. Even my husband, who doesn’t get sick of food easily, said while eating the fourth bagel of the week “we should probably have real food.” I blame stress at work, getting a flu shot and feeling like crap, and having a cavity filled last week. My arm was so sore from the shot that it hurt all day, even when I wasn’t moving it. Driving was not fun. I hate cavities and this one had the side effect of making my tooth sensitive. I had a lot of Novocain when it was filled and I spent half the day where I couldn’t feel half of my lips. In fact, it was so much that my left nostril was numb. Boy was that weird feeling. Here’s to a better week (both eating wise and all around). In an attempt to work with my food mood, we made pizza, but in a skillet! Have you ever tried this? It’s like a deep dish pizza but without all the grease that typically comes with one. We even joked that it was like certain deep dish pizza chain’s pizza, but where the oil needed was measured in teaspoons instead of quarts. I’m not really one for blogging about fancy pizza topping combinations. It’s fun to see people’s creative concoctions and at the end of the day I think most people will do their own thing. We made a standard issue pepperoni pizza (because that’s my boo’s favorite). This is less of a recipe, and more of a nifty set of instructions about how to cook pizza in a different way. My husband was skeptical when I told him that I wanted to make this. How will it taste different than a regular pizza you throw on a baking pan or stone? The short answer is that it still tastes like pizza, but it’s got some extra fun stuff going on. Somehow the pizza crust is magically thicker than if you had rolled it out thick onto flat surface. This was actually rather convenient. Less fighting with the dough, no rolling anything out, and it came out amazing. The pizza crust had a tiny bit of fried texture on the edges from the oil you put in the skillet or possibly from delicious cheese grease. When you bite into a piece the crust is lovely and chewy on the inside. Gosh, I wish we had leftovers. Make the pizza dough. We did the overnight rise version which isn’t mentioned in the post about the dough. Basically you just make the dough and put the bowl in the fridge overnight and pulled it out a couple hours before making the pizza. Divide the pizza dough in half. Coat a 10 inch oven safe skillet (cast iron is a great choice) with 1/2 tablespoon of oil. I use the Lodge skillet. Talk half of the pizza dough and place it into the skillet. Spread it around the bottom of the skillet with your fingers. It’ll take a little doing but it sure was easier than rolling it out. (Optional) If you’re feeling adventurous, go for 1 or 40 toppings. Be careful… Every pan is hot when you take it out of the oven, but since we are dealing with a cast iron skillet in a 450 degree oven here, I felt it worthy of reminding you to take care because it will stay hot for quite a while. Note: You don’t need to use a cast iron skillet. You only need to make sure your skillet is oven safe at 450 degrees F.
You just helped me answer the question, “Whats for dinner mom?” Perfect and simple and for certain teenager friendly meal. Just shared! These are great! Here’s another idea I use for a quick lunch or snack. 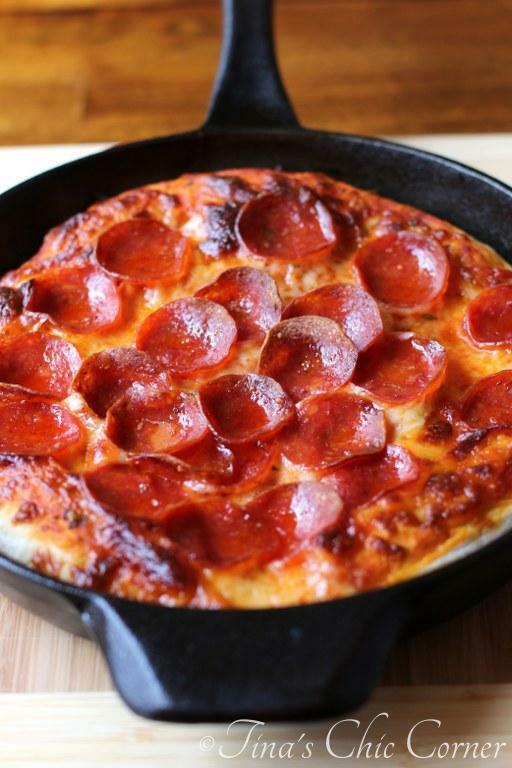 Same concept but I cook all the toppings together with the sauce in a 6″ skillet, remove then lightly crisp flour tortilla in either butter, mayo, or olive oil (I like thin crispy crust) add back the sauce, top with cheeses of your choice and top brown on the broiler setting in the toaster oven. Takes about 15-20 minutes total. Perfect! 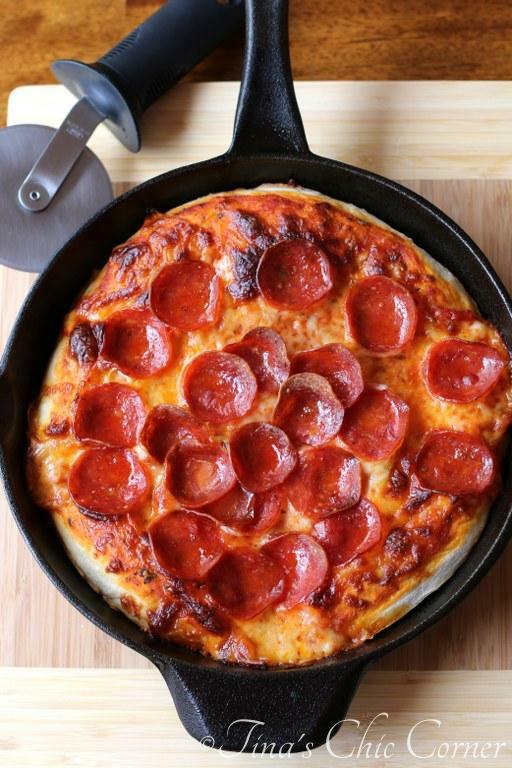 Tina – outstanding blog and Directions on this Cast Iron Pizza. I have cast iron, cooking ability and I am Italian and have Never thought of this. Made it tonight and it was a show stopper! My wife and daughters said it was the best pizza they ever had…they are not always to easiest to please. Looks very delicious! Homemade comfort food! What can be better? My flu shot hurt my arm for an entire week and my shoulder was swollen like a goose egg! I got sick, too, and all I wanted was empty carbs. I hope you’re feeling better now! 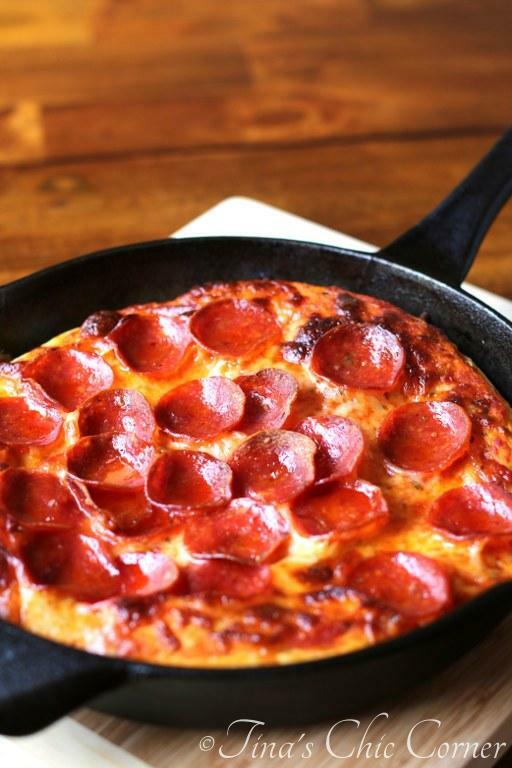 This pizza looks absolutely delicious, and I love that it’s thick and made in a skillet! Oh wow! Thanks Marcie. My arm is finally feeling better. Hopefully our suffering will have been for a good cause…keeping the sickies away! 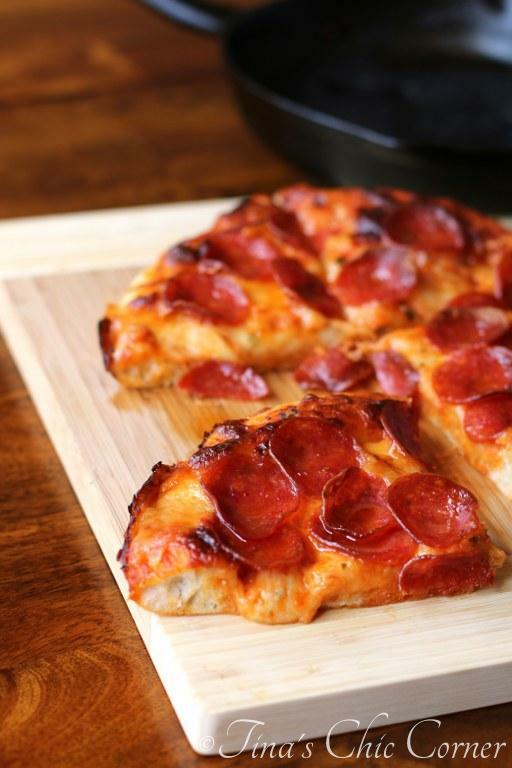 Tina, I make something like this, but I use Bisquick (rolled thin) for my deep dish oven Pizza….it works beautifully. A little different consistency, but it works in a pinch. Ooh, that sounds amazing! I’ll have to mention it to my husband and give that try. I’m all for trying every pizza recipe out there… for the sake of experimenation of course. 😉 Thanks so much for stopping by! Beautiful, Tina! Now if I can just find an old, seasoned cast iron skillet! I’ve been searching for a while. I was just recently reminded to look on Craigs List.. (doah!). Love your rendition of pizza in a skillet. One can never have too much pizza, especially when one is in NEED of comforting! Wishing you a much better week this week, Tina (sounds like it all hit at once!). Thanks so much for your well wishes. 🙂 I found that it didn’t take long for my iron skillet to get “seasoned.” I was actually hesitant to buy one because they can be a bit more expensive than a regular skillet. But I’m happy we have it. It’s hard to explain but the food does taste different and I’ve heard that they last forever. Looks so Yummy! am going to give it a try with my daughter. Regarding cast iron….just getting into it myself. Your skillet looks different than most I’ve seen. Care to share who makes it? and what size? Boo to cavities and shots! But yay for pizza. I made skillet pizza for the first time last week and am now obsessed! I love to use my skillet for pizza. Your crust looks perfect! I’ve never made a skillet pizza before, but this post makes me want to give it a shot. Like, this week. Or maybe this afternoon… How could it not be wonderfully delicious? Thanks, Tina! I’m lucky to have a guy who’s so supportive. Luckily, I haven’t had any CRAZY cravings just yet, though I wouldn’t be surprised by them at this point. And I agree with you: I think I should have some of this pizza. I’m sitting at 22 weeks, so I’ve gotten over the craziness of the first trimester and am cruising in the second. I’ve heard the same thing. 🙂 And I totally agree! I’m took some time to catch up your posts since I fell off the face of the earth…er, scratch that…since I took a break to move and get the family settled. Glad to be back to see the awesome recipes you post! 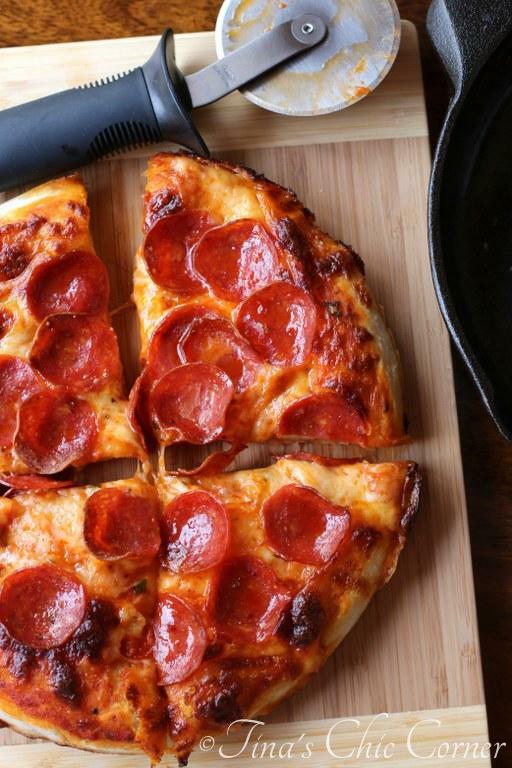 I love the idea of homemade pizza in a skillet. I believe that skillets make every dish better, this looks delicious! Oh I get in those food moods all the time!! I’ve been having an off couple of days (not feeling so hot, work headaches, errands popping up like crazy…one of those), so lately my dinner picks have been seriously swayed by my cravings. Tonight I ate french bread pizza, but if I had thawed the pizza dough I have sitting in the freezer beforehand, I totally would have made this!! This looks like the perfect comfort food and a nice twist on a favorite. Mmm! Ugh, feel better Alyssa! I’ve had a headache for the past 2 days so I can totally relate. I sure did see in instagram. 🙂 I can’t wait to see what you’re going to create with it! Oh my word! That pizza looks AMAZING!!! I’ve made pizza in a cast-iron skillet, but it didn’t look as amazing as yours did! Okay, dumb question: what do you do with the other half of the dough? Do you just save it for the next pizza? Or can I get away with making half the dough recipe? I’ve been delaying the purchase of cast iron skillet for so long, but that pitcher convinced me, it’s be time. I’ve been overinduging on my own calzones (Contadina Pizza Sauce is fabulous but after a why I overdose on it, then wait for a few months, then I can’t live without it again for a week. I just hate having to roll out the dough and getting flour all over the place, so a skillet is a nice idea, just one dish to clean. Btw, I got an idea rolling around in my head of a deep dish in a skillet but with a layered crust, but can’t figure out whether to sprinkle some cheese between crusts or try some other way of making faky crusts. Maybe like a deep dish lasagna type. Saw this post on imgur! It definitely looks tasty. Just wanted to explain the “thickness” of the dough. Its because you’re hand spreading it (which is how everyone should be making their pizzas). Rolling pins basically squash out all of the air pockets that you worked so hard to develop using your overnight cold ferment. Oh thank you. This found its way onto my pinterest feed and thank God it did. I didn’t feel like fussing with the chicken breasts I’ve had marinating (splitting, tenderizing… I’m over it). This is dinner at my house tonight! Oh yes, this is the only way to make a pizza. I have been using my large cast iron skillet for last few years now and it always comes out great! I use a larger pan tho. Another thing that is a must try is making pies in a cast iron skillet. These too come out spectacular. They have that old fashion homey look but also the crust is beautiful. I have a whole set of cast iron skillets given to me by my grandmother when I got married. They had been hers thought her life. And considering I am a great grandmother (3times now) now, you can only imagine how old these “jewels” are. Oh wow! I hear cast iron skillets last forever… Maybe they are right. ;). Mmm pie?! I definitely need to try that! I know my version will not be nearly as good, but in effort to save some time, can anyone recommend a store bought dough for this? Most grocery stores sell the dough in little bags in the same area as you can find fancy cheeses (or in some other section they will point you to if you ask). If you can’t find it in the grocery store some pizzerias will sell you their dough if you ask. This looks good! Could you share what cheese and sauce you used? Why do you use only half of the dough? Only half of the recipe will fit in my size skillet so we make 2 pizzas. The recipe say to use just 1/2 of the dough. What do you do with the other 1/2? The recipe looks really good. I’ll have to make it for my husband tomorrow. I’ve never made pizza dough before and was wondering how do you do the chill method of rising the dough. It’s been such a long time since I’ve done anything remotely resembling bread dough since the time constrains but now that I’m home all the time I might just get back into it again. In general the chill method is where you put the dough in the fridge for a long time instead of the more typical “put it in a warm place to rise” like you see in most recipes. If you are rising your dough in the fridge it’s the same process overall but I wouldn’t let it rise for less than about 8 to 12 hours. Overnight usually works pretty well. Thought I’d take a gander on Pinterest to decide what to have for dinner. And lucky me, I saw skillet pizza! Haven’t made this in a while and it always hits the spot… and you are so right, nothing beats food cooked in cast iron. i only made pizza in my cast iron skillet once and was perfectly happy with it. You are right to warn about how hot the pan will be, especially since cast iron is so heavy. To the reader who is concerned about the seasoning of the pan, please be aware that they are very easy to re season. If some gunk gets stuck on my pan I scour it and re season by putting vegetable oil in it and putting it in a hot oven. Usually wait until I’m using the oven anyway. And I do know that we are NEVER supposed to scour the pan. Nevertheless…….. Thanks for your post. It makes me want to make more pizza! Susan, I absolutely agree that it’s easier to clean an iron skillet than I think most people realize. A little salt and oil goes a long way to bring back to life if need be. These things last “forever” for a reason. We have cast iron skillets it is the only kind we use. I have done skillet pizza and you are right they are fantastic. I have not done them in a long time, thanks for the reminder. Thanks for sharing. Anytime! 😉 I appreciate you stopping by! In your dough recipe, you said that you didn’t know if the dough does well in the fridge overnight. Does it? Do you need to let it rest and punch it down or anything once it’s out? I’ve never made a successful dough before. Thanks! I haven’t done this dough recipe in the fridge. I’d imagine it could work if you give it a long time (8 to 12 hours or overnight) but I can’t make any promises. The rest of the process would remain the same. I don’t even use the oven. I just brown the dough on one side, turn it over, brown that side and put the toppings on. Interesting. I’ve never thought it try it that way. My husband & I love our iron pan too! We use it often & have even debated over adding a bigger skillet to our collection. This variation is just as great and versatile. Good for you finding a great recipe. I made this exactly, but it stuck completely to my cast iron pan. I used the oil, but it didn’t help. Any suggestions? Hmm, the only thing that I can think of is that you might not have used enough oil. Try seasoning your cast iron pan again before using it. Good luck! To make the second pizza, do you have a second skillet or do you wait for the first skillet to cool? Do you think this would work in a cast iron Dutch oven or is it too deep? Thanks! Can’t wait to try it this weekend!! Beth, I only have 1 skillet so we wait for the first pizza to be done and then use it once it’s cooled for the second pizza. I’ve never used an iron dutch oven so I’m not sure if it would yield a different cook time or end result. Let me know how you make out! I love my cast iron skillet and we LOVE pizza. I make it at home often, it’s so much cheaper and pretty easy. I just never thought of combining the two. (Pizza & skillet) LOL I can’t wait to try this. That looks awesome! My fiance graduated from culinary Seattle. I am so lucky! Cooks for my parents who are retired. Need to buy another skillet. Mom says it will last your life time. Thomas and I met in junior high. Over the years and there have been many, I have used my iron skillets for so many things. Cooking pizza never has been one of them! It sounds an looks so good that I should love to try it. I think I shall get the store bought dough as I’m not in to making it right now. But it does indeed sound like something I would like to try out on the grandchildren (one at.a time, lol). Thanks a lot for sharing!! Hello, do you first heat the skillet before putting the pizza together in it? I see a lot of recipes in C.I. call for heating it first. Hi Elizabeth. I’ve seen similar but I did not pre heat my skillet for this recipe. I’m afraid I’ll burn myself when trying to spread the dough. Hi. I just came across thismrecipe on Pinterest and made it. I am a big pizza guy and have made various pizzas for the family over the years. This is the first time I did a deep dish. My family and I loved it. I did a few recipe substitutions of my design and preheated the skilllet at 500 before putting in the dough. I also ran the dough through the mixer for 20 minutes and let it rise for an hour in front of a gas fired fireplace. The crust was angelic! Will certainly make this again. P.S. i substituted 1/4 cup of 2%milk in the recipe. It really makes a difference in dough texture and taste. Thanks again for the inspiration. This was awesome! I did it Chicago style with the sauce on top and the crust was nice and crispy on the bottom. Thanks for the fabulous and easy idea!